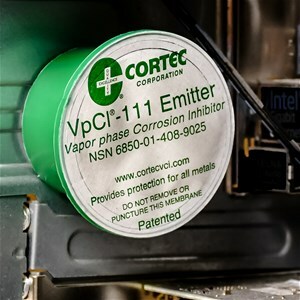 VpCI-111 emitters are unique devices designed to provide corrosion protection for metal components and parts enclosed in non-ventilated control boxes, cabinets or tool boxes up to 11 cubic feet (312 liters). The VpCIs (Vapor phase Corrosion Inhibitor) emit vapors, which form a molecular layer on internal metal surfaces to protect critical, complex and expensive electronic equipment during operation, shipping or storage. VpCI-111 is a small, patented plastic emitter with a breathable Tyvek membrane through which corrosion inhibitors are slowly released. VpCI-111 provides long term protection against corrosion even in the presence of adverse conditions including salt, moisture, airborne contaminants, H2S, SO2, NH3 and others. 10 individually sealed emitters per carton. Each emitter measure 2.25" diameter by 1.25" high. VpCI-111 is extremely simple and convenient to install. VpCI-111 emitters should be installed as early as possible, preferably during manufacture or assembly. Simply select a space within any enclosed device where corrosion protection would be useful. Verify that the surface on which the device will be installed is clean and free of debris. Peel off the protective peel strip from the bottom of the device and attach it to the clean surface. The peel strip can be separated to reveal a self-adhesive sticker on which the installation and replacement dates can be noted. VpCI-111 emitters can be installed in any position. For volumes greater than 11 cubic feet (312 L), install more than one VpCI-111. If the enclosure is not totally air-tight or if the access doors are opened frequently, replace the VpCI-111 emitter more often than every two years. After periods of heavy maintenance, replace the emitter. For additional protection spray the enclosure very lightly with ElectriCorr VpCI-238. Packaging: 10 individually wrapped devices per carton. Protection: 11 cubic feet (312 Liters) per device.